New palynological information from the Poti Formation (upper Visean) at the Roncador creek, Parnaíba Basin, northeastern Brazil. M. di Pasquo and R. Iannuzzi. 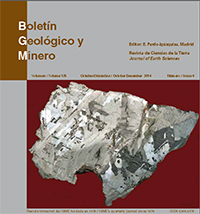 Stratigraphic and facies study of a dinosaur tracksite, Sol de la Pita 1, from the Lower Cretaceous of the Cameros Basin (Préjano, La Rioja province, Spain). J. Hernán and J. J. Moratalla. The first uses of groundwater in the Iberian Peninsula. The Daimiel “motillas” in the Bronze Age of La Mancha. M. Mejías Moreno, L. Benítez de Lugo Enrich, J. del Pozo Tejado and J. Moraleda Sierra. The analysis of the geological potential for industrial rocks in land-use planning projects: a review. G. Hernández-Durán , J. C. Arranz-González and R. de la Vega-Panizo. Palynology and micropaleontology of the Cretaceous of the James Ross Basin, Antarctica. Review of current knowledge. C. R. Amenábar, A. Caramés, M. Lescano and A. Concheyro. New data for Athabaskia anax (Walcott, 1916) (Middle Cambrian, Trilobita, Corynexochida) from the Mendoza Precordillera, Argentina. A quasi three-dimensional model for the simulation of seawater intrusion into coastal aquifers. A. Hachemi and B. Remini. P. Adánez Sanjuán, J. F. Llamas Borrajo, J. Locutura Rupérez and A. Garcia Cortés.